I’m often embarrassed walking around Christian bookstores and seeing isles filled with Christian “tchatchkes” (Yiddish for trinket) that add little or no value to the lives of believers. Most of them just get thrown into the already cluttered world we live filled with more stuff than we could ever use or need. 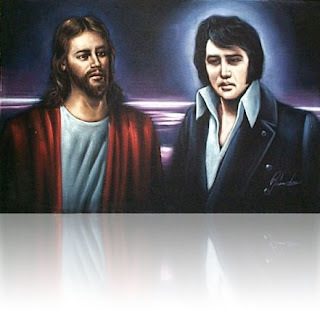 After all, who really needs another velvet painting of the King, and, no, I’m not talking about Elvis here. But once in a while something comes along that blows away the chattel people consume. Caviezel and a host of great actors. 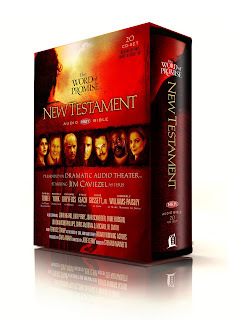 These are not just good reads of the New Testament books, but a fully enga ging, theatrical rendition faithfully taken from the New King James Version. 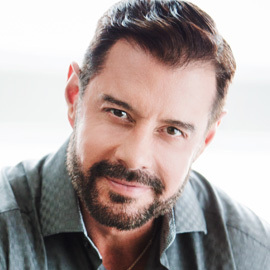 What a great product–visit their site and listen to a few samples and you’ll see what I mean. I remember getting goose bumps as I first heard Romans 1 featuring the voice of Stacy Keach. The product stands alone in its quality, but there’s another side to this story. I’ve had to privilege to spend time with Jim Caviezel in the past few months and get a glimpse of his heart and passion (no pun intended) for God’s Word. Jim is the real deal and his commitment to God’s Word is evident not only by the quality of The Word of Promise Audio Bible but also by his personal walk. We need more projects like TWOP around and less tchatchkes ( I just love that word). And, as my new year’s resolution, I’m selling my velvet Jesus collection next year. I have just started listening to The Word of Promise – John and Mathew – it is the best gift I have ever received. I have been inspired and moved to learn more about what I thought I knew for years. I can not wait to listen to it all. Gigi S.
Gigi,I'm glad you've enjoyed it. I hear they have begun work on the Old Testament as well. You couldn't be more correct when it comes to the overflow of 'Jesus Junk.' Many Christian-related products do have a meaningful message, but it's rare to find something that is compelling, engaging and easy to share with others. I was given TWOP by a friend and at first was hesitant to pop in the CD… after listening to the sincere rendition of the Gospel and the powerful musical score, I was hooked. Plus, it makes my commute to and from work a lot less stressful!